Sometimes blogging just doesn’t go your way. It’s kind of like running when you have a race outcome that you’re not completely satisfied with. You wish you could remember where you went wrong, you wish you could remember the good parts instead of all the bad parts, you wish you could banish the negative energy. Now transfer those thoughts over to writing and you’ll find my current position. I’m sitting in front of my computer, trying to recount the phrases that ran through my head during last night’s Spinning workout. There’s something about me and biking—and Thursday night, only Thursday—that revs the creative juices in my brain, giving me oodles (yes, oodles) of thoughts to run back home and jot down. Except last night I needed secret powers or magnetic energy, anything, to transfer my thoughts to paper before class ended. By the time I got off the bike, all the phrases I tried so hard to remember as I pedaled through climbs, headwinds and sprints weren’t coming together as well as they had during the sweat session. I can remember keywords like REI fleece pants, snowshoeing, slipping on ice and doubling up, but ask me to connect them all together in carefully crafted prose and I’m stuck in my tracks. You see, all of those phrases are supposed to explain my affinity for the Craft running pants I modeled at the Fleet Feet Fashion Show last month. I’m practically as clueless as you, reading this for the first time, figuring out how I meshed them together in a cohesive, rational thought, which I swear I did but needed a notebook next to the bike so I could hop off and jot it down. Let this serve as a long-winded introduction to the Craft tights pictured above. And now onto the review. When it comes to winter running gear, I’m focused more on how it can double for other pursuits than how it holds up in frigid temperatures and strong winds. That’s how it went down between me and the Craft PXC Storm Tight. Sometimes you just need running gear for more than running. Or I do. Because chances are the last thing I’ll be doing in the gear is wearing it through a snowstorm, a winter half marathon or a sub-zero training run. You see, I rarely run. Once the first snowfall hits, or even before depending on the temperature, the wind and even my mood, I’ll beeline to the gym. Period. It’s sad. It’s pathetic. I know it. But a few nasty slips on ice and 30-minute hot shower thaws, followed by cold-air-in-the-lungs hacking, and I’m done until spring. I’ll trade the sneakers for snowshoes and the track for the treadmill, or more likely the elliptical. But the PXC Storm Tight might be enough to change my no-winter-running mind. And even if they don’t, they’ll be huge assets for my cold-weather bike commutes and snowshoe treks. 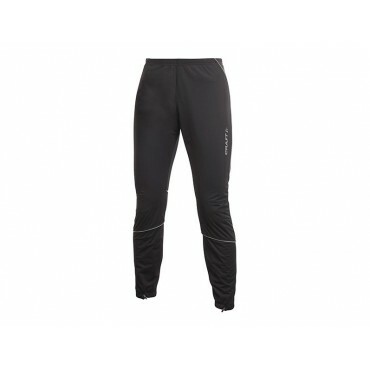 I can appreciate all the running perks: the zippered legs for ventilation, the wind sheath to keep the quads warm, the fleece lining. I can finally stop wearing the same old REI tights over and over simply because they were the warmest. It’s just funny how these winter layers have a different purpose when they hang in my closet. They need to keep me warm pedaling my bike to the gym or yoga or a lunch meeting. And they have—I’ve tested them once already and they’ll be tried again in today’s cold temps. They pull on like sweatpants but look so much nicer. Stacy and Clinton shouldn’t scoff too much even if these break their casualwear rules. Do I care? No, I practically live in workout clothes. They can be layered—I pulled them over cycling shorts. Not something I could do with most tights in my drawer. And the reason they won over my other option, a storm tight by Nike. That and I already have a version of the Nike tight, minus the wind layer, so I told myself to branch out. For snowshoeing, they best the fleece-lined tights I’ve had for nearly a decade. And that’s on sight alone. The Flex Fleece starts at the rear knee, below is the same material as the wind layer, which should keep snow spraying off the snowshoes from settling and minimizing the wetness I’d get with the other tights. The looser leg means socks don’t always have to go on first as they do with the tights. And the wind layer couldn’t work better with the strong gusts we always find along the Lakefront, and my snowshoe spot, this time of year. I know they’ll hold up, but I need more snow to actually test my theory. As for how they stand up running? You’ll either need to convince me to run Sunday’s Rudolph Ramble—and hope it’s cold like today or I’ll be wearing my compression tights—or try them yourself.